The Art Gallery Society of NSW is thrilled to present the 20th anniversary season of Resonate, and we invite you to join in the celebrations. Immerse yourself in the visual delights of the Art Gallery’s exhibition program before sitting down to experience some of the finest performers from Australia and overseas, while listening to the sublime music of the world’s greatest composers. Resonate 2019 will feature a celebratory program of favourites, newly established artists and performers from the very first series. To mark the occasion of Resonate’s 20th anniversary, we have a special evening of celebrations planned for our September concert. A night of Spring Elegance awaits you at the Gallery with a champagne reception and dinner by Chiswick while Emma Pask and band set the tone for a memorable night of music and dancing. Geraldine Turner and Brian Castles-Onion will open the 2019 Resonate program with a collection of wonderful music from the 20th century American popular songbook. Songs from Turner’s vast career in musical theatre are intertwined with her amusing stories and anecdotes, whilst Castles-Onion shares stories from his stellar opera career. Composers from Cole Porter, Gershwin, Berlin, through to Sondheim, Weill, Lloyd Webber and Jacques Brel are celebrated in an intimate, evening of songs and reminiscences. Geraldine Turner was part of the very first Resonate program and is thrilled to return for our 20th anniversary. Delight in a little night music by Beethoven, Haydn and the musicians of the Sydney Symphony Orchestra. Twelfth-century abbess, mystic, scientist and poet Hildegard of Bingen invokes the ‘celestial symphony’ in her plainchant Ave Generosa – a song of praise to music and nature and the perfect way to begin a Resonate concert. Contemplate Beethoven’s string serenade, arranged by Principal Double Bass Kees Boersma. A party piece intended for a soirée ushering in dances and songs with a jaunty march. Experience Principal Cor Anglais Alexandre Oguey’s appropriation of Haydn’s Gypsy Rondo piano trio in what promises to be a magical evening. The concert will be preceded by light refreshments and a private exhibition viewing. Doors open at 6.30pm. Concert commences at 7.30pm. This event will be held in the Grand courts. The Orava Quartet has been hailed by Limelight magazine and The Australian as 'the most exciting young quartet on the block’, 'world class’, and 'the real deal’. Earning a reputation and devoted following for their thrilling performances, the Quartet bring their unique sound and breathtaking intensity to the classics of the string quartet canon. Selected by Deutsche Grammophon Australia for the label’s first ever recording release, Orava have performed throughout North America, the UAE, and Asia, working closely with the world-renowned Takács Quartet and winning top prizes at the 2013 Asia Pacific Chamber Music Competition. 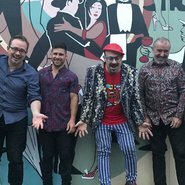 Since returning to Australia, the Quartet has made an impressive and rapid rise to national attention, performing at major festivals from BBC Proms to VIVID Sydney as well as the Melbourne, Canberra and Queensland Music Festivals. In this concert, the Orava Quartet inject their signature passion and vivacity to works by Haydn, Schulhoff and Brahms. One of Australia’s favourite sopranos, Greta Bradman, and ARIA award-winning, internationally acclaimed pianist Tamara-Anna Cislowska come together for an evening of sublime and uplifting songs from around the world. With music from Bradman’s latest album, Home , and Cislowska’s recordings of Sculthorpe and Kats-Chernin, this promises to be an evening of beauty and enchantment with two extraordinary women at the forefront of classical music. Fans of their programs on ABC Classic FM- Weekend Mornings and Duet – will relish this rare opportunity to see both performers sharing the stage in this stunning collaboration. The concert will be preceded by a champagne reception and a private exhibition viewing. Entrée buffet and set main course will be served throughout the concert. Doors open at 6.30pm. Concert commences at 7.30pm. This event will be held in the Entrance court with cabaret-style seating.